I normally haven't worried about the timeliness of my updates because I am usually just posting articles as I weave along. However, Cookie commented on the original self striping yarn post, noting that the mix of a solid yarn with the Rosario Multi with woven slubs (I love that word) would make a great scarf. I totally agree and am really glad she mentioned it because it never crossed my mind. The combination of the two yarns looks extremely rich and feels very soft and silky, it would be great for a scarf. as a shawl, now going through revisions. Okay, so here's the irony-- and the reason I felt compelled to write Part Two of this saga (out of a likely three or four part narrative). I am working on a shawl using the two yarns shown to the right. With this item, I wound on two layers of the Multi, one layer of the Caron Simply Soft and then wove with the Caron yarn. I got a little concerned that I hadn't bought enough of the Multi for the multiple projects I am using the yarn for, so I returned to JoAnn's only to find that it was no longer in stock. It was no longer in stock at any of the stores in Minneapolis and I found that it is currently out of stock online (as of 6/6/14). The JoAnn's people have reassured me that it will be back in stock at some point but I don't know when. I feel like there is a lesson here-- and its not "make sure you get enough yarn before you start" because if I tried to follow that motto I would have to buy all the yarn available in the stores rather than just most of the yarn. No. The lesson I am going to carry away is that although looms last almost forever, yarn does not. And if one fabulous yarn recipe isn't available, we can make more. I am currently weaving some squares for a new Soft Box that needs to have a shiny "under the sea" look to them. 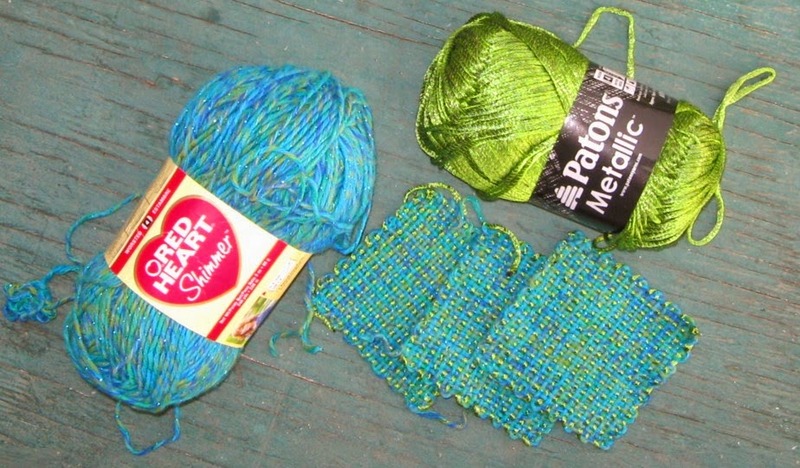 Since the other mix isn't available, I am using a mix of the two yarns below. I wound all three layers on the loom using the variable Red Heart Shimmer "Peacock" color and then wove through with the lime green Patons metallic. I think it looks pretty great. And here's the cool thing. If these yarns suddenly disappear there will be other wonderful variable yarns to weave. For example, its becoming popular to make scarves out of un-worked yarn. The skein below offers incredible variations in color and texture that will work wonderfully in weavies. My plan is to wind the scarf yarn on the loom and then use something that is very easy to work, like Caron Simply Soft or a worsted wool, to weave through. You know, considering the pace of incredible new yarns now coming on the market, this topic may end up having five or six parts... what yarns are you falling in love with? Color combinations are challenging for me. I take note whenever I find any that are pleasing. The ones you've shared are very lovely.